Visitors to Kielder Water & Forest Park are being urged to train their eyes on the skies over the next couple of weeks, with the area's famous ospreys expected to return to the area soon. The annual visitors have been playing out a soap opera in the skies of Northumberland since their recolonisation in 2009, with births, deaths, reunions, pairings, hatchings and even the odd spot of philandering that would be worthy of a storyline on Coronation Street. Ospreys have been spotted closer and closer to Northumberland in recent days, suggesting an imminent return to Kielder and the first sighting in the county could only be days away. In 2018,8young ospreys -Blackaburn, Bywell, Bamburgh, Broomlee, Binky, Byrness, Beldonand Belling - were among those that migrated for warmer climes in late August, or early September. It was the second year that the Kielder osprey chicks had been given names, this time all beginning in B. The 2019 chicks will be named using the initial C.
One bird, dubbed Yellow 37, has inhabited Kielder′s Nest 2 site in past years and has historically been an early returner from wintering grounds, normally in West Africa. Keen watchers will be looking to see if he arrives first in the coming days. 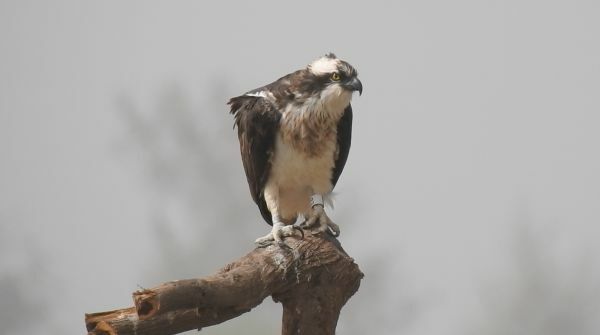 Shortly after the birds have returned, visitors will be able to enjoy Osprey Watch and observe the birds on nest 1A using telescopes, and the live nestcam network provided by the Forestry Commission. Northumberland Wildlife Trust will be running Osprey Watch from its cabin behind the Boat Inn at Landal Kielder Waterside between 10.30am and 5:00pm every Saturday, Sunday and Bank Holiday Monday (and extra Wednesdays in July and August) from Saturday 20 April until Sunday 18 August. A nest viewing screen will also be operating in Kielder Castle Café. Lynn Turner, Director at Kielder Water & Forest Park Development Trust, said: "There's a real buzz around the area at this time of year, because the Kielder ospreys are a real fixture in the calendar now. "We are all looking forward to their arrival again and the chance to celebrate a fantastic example of species recolonisation that has added a new level of wonder to an already fantastic part of the world." The Kielder Osprey Project is a partnership between Kielder Water & Forest Park Development Trust, Forestry Commission, Northumberland Wildlife Trust, Northumbrian Water and Calvert Kielder. The partners are working hard to ensure that the ospreys are here to stay by maintaining a high quality habitat in Kielder Water & Forest Park and safeguarding and monitoring the nest sites.